Almost everyone looking at the boat for the first time said variations on the same theme: ‘what a great fishing boat’. And they were right. Apart perhaps from some cold storage, all the ingredients were there. But, more importantly, so were all the features that long experience said were vital or desirable in a rescue boat. Not surprising when the builder has spent half his life as a sea rescue volunteer and is an ex deputy commander of Cockburn Sea Rescue Group. Andrew Wright has endured appalling weather on long searches and knows what is needed. Size and presence on the water are useful attributes. “Assure”, built by Shockwave Power Cats, is unsurprisingly a cat. 8.2 metres by 3 metres gives her a big footprint and abundant stability as well as generous working space. Previous examples have been built in open, half cab and lockup cab variants; this is the first to be built as a walk around cab. 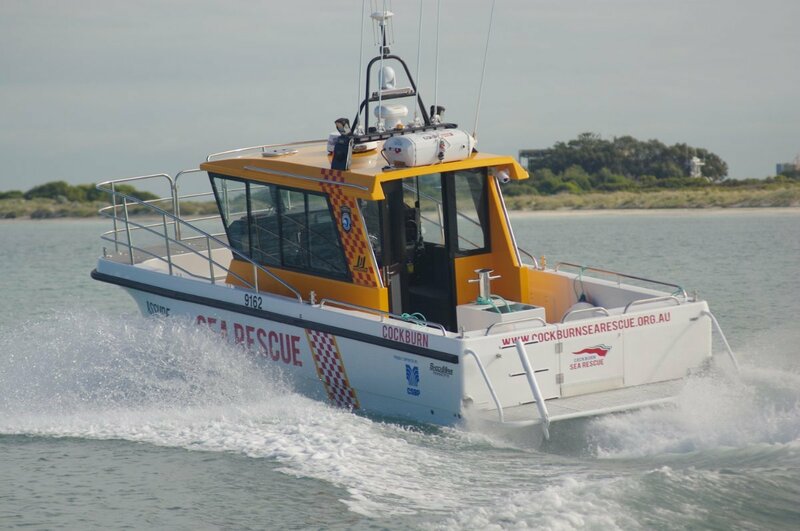 This style works well for sea rescue – quick access for the crew to all parts along 400mm side decks with full height side railings. This is the feature that brightened the eyes of viewing anglers: seven metres of rail available on each side to complement stability that can cope with shoulder to shoulder fishermen. Despite the share of beam taken up by those side decks the wheelhouse is far from cramped. Two Shockwave suspension seats at the fore end have ample space between them. They face consoles that are a model of organisation. The aim was minimum stretch for eyes and hands, with logical groupings of functions that quickly become instinctive. Some controls need no stretch at all. 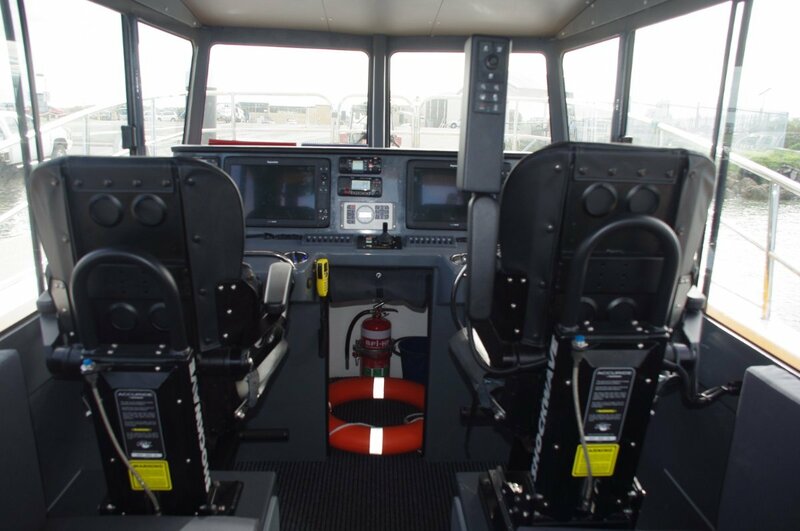 Engine and seat controls are in the arms of the skipper’s seat making their contribution to ease fatigue on long missions – as does the power steering. The wheelhouse gets plenty of natural light through large area stick-on glass, but glare is subdued by the forward raked windscreens and an interior finished in matt grey. Glare is one of the unsung contributors to fatigue. Behind the suspension seats are simpler settees for up to four more crew members. These members have the protection of a fatigue membrane on the deck and a share of the vessels 16 grab rails on the deck head. There is room left over for lockers for ancillary gear, Stowage generally has been given importance throughout “Assure”, allowing uncramped dedicated locations for every item. The hull can be powered by outboards, but the logical units for long searches and heavy duty towing are diesels. The choice fell on Yanmars, a pair at 315hp each driving through duo-prop legs. Propped for towing they can still manage 36 knots at full speed. For leisure use this would rise to 41 knots. Total fuel capacity is 800 litres; at the current consumption rate that equates to an endurance of 47 hours without reserve. “Assure’s” hull, in resin infused E-glass, has a great deal of complexity incorporated to achieve its results. The asymmetric design uses Tapered Tunnel Technology incorporating a wave breaker, and large chines to provide exceptional lift. The ride is dry – including a near absence of the maddening mist that can bedevil the after decks of cats. Ride and sea keeping are unsurprisingly excellent. Vessels that are adaptations rather than purpose built show their origins in the detail: items fabricated and located where convenient to the builder rather ideal for the job. A couple of examples on “Assure” demonstrate the opposite. Fire pumps are typically items pulled out of stowage on demand, with their suctions dropped overside. Here, though, the pump lives in a specially moulded compartment that doubles as a cockpit seat, and it has a permanent suction under the after deck. The tow linehad similar thought devoted to it. No flaking down needed here: it is contained on a drum within a mid deck compartment moulded around the to post. And all this after deck activity is monitored by CCTV. Cockburn Sea Rescue usually carries out more rescues each year than any other group. Its members are confident in their belief that they have the West’s most capable vessel.